I’m in the middle of visiting family before the school year starts in the Hargett household. With plenty of beer and cheese to sate my appetite, Milwaukee is the perfect place to enjoy a little calm before the storm. I’ve got cheese curds, plenty of microbrew and good company. You can’t ask for much more. While I was rounding up these dietary staples earlier today, I remembered that consumer goods and grocers are among those sectors that investors turn to when economic conditions deteriorate. After all, people need to eat and buy basic supplies regardless of the conditions on Wall Street or Main Street. Regular readers know that, lately, I’ve researched investment ideas designed to hold up (or even rally) in the event of a market correction or economic recession. Both my colleague Ted Bauman and I are more than a little concerned regarding current market conditions, including rising interest rates and their relation to debt levels and the overvalued U.S. stock market. Once again, I’ll leave the exact specifics to Ted. Today’s trading idea comes to you courtesy of my hometown, the Greater Cincinnati area. Sometimes you have to leave home to put things in perspective, and Cincinnati is home to one of the best investing opportunities in the grocery sector. Crowded with big names like Walmart and Target, competition in the grocery sector has always been fierce. And since Amazon’s acquisition of Whole Foods, the sector has become quite a jungle. But that hasn’t stopped the U.S.’s largest supermarket chain. The Kroger Co. (NYSE: KR) operates more than 2,800 stores in 35 states. Fundamentally, the company has averaged growth of more than 10% a year for the past five years, compared to a 2% contraction at leading competitor Walmart. While part of this outperformance is due to Walmart’s sheer size, it is also due to Kroger’s implementation of home delivery and online ordering features. Amazon’s Whole Foods move forced everyone to think outside of the box. While others foundered, Kroger acted decisively and quickly, rolling out ClickList online ordering/in-store pickup and Instacart two-hour home grocery delivery. Now Kroger is cutting deeper into Amazon’s online delivery niche with the launch of Kroger Ship. The Kroger Ship service promises grocery delivery as quick as the next day in certain areas. The service will initially be offered in Cincinnati, Houston, Louisville and Nashville, but will eventually spread out nationwide. What’s more, shipping is competitive with similar offerings from Amazon (minus Prime) and Walmart, with free shipping on orders of more than $35, and $4.99 shipping otherwise. What’s more, Kroger is already planning capital investments to improve growth down the road. It’s adding a distribution center in Kentucky, and has partnered with British online supermarket Ocado to help automate and streamline its own e-commerce offerings. Part of the plan is to boost Kroger’s digital and robotics capabilities via building out fully automated distribution warehouses — much like those that Amazon is considering. While investments like this have run counter to the short-term nature of many popular Wall Street stocks, Kroger’s efforts are paying off. For instance, the company recently beat consensus earnings and revenue estimates for the first quarter. Kroger also narrowed its full-year guidance to $2.00 to $2.15 per share from $1.95 to $2.15. 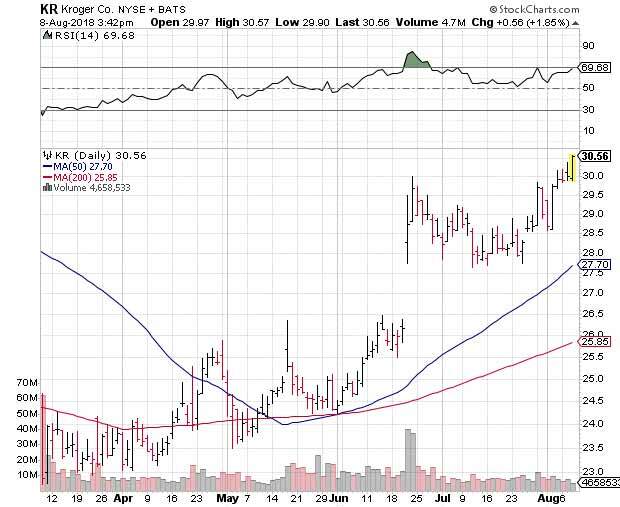 The effects of Kroger’s sound leadership can be seen in KR stock’s price action this year. The shares have soared more than 34% in the past five months, closing in on fresh 52-week highs. What’s more, analysts are taking note of how Kroger is handling the threat of online competition. In fact, Epoch Investment Partners told Barron’s last month that KR stock could trade in the mid-$50s. KR shares have already claimed a perch north of $30, and are well on their way toward that $50 valuation. That said, KR’s Relative Strength Index continues to hover just shy of overbought levels near 70. In other words, the stock is poised for a bit of profit-taking and a period of consolidation. Overall, Kroger is a solid addition to any portfolio. This is doubly so given the tendency for grocery stocks to outperform during periods of economic turmoil. So, whether or not you are worried about a coming market crash or economic collapse, KR stock remains a solid investment. I recommend picking up KR stock in the $29 to $30 range as the shares work off and consolidate gains from their recent rally.